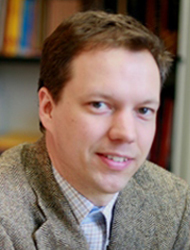 Carsten Sönnichsen is an expert on the production and application of nanoparticles as markers and sensors for biological molecules. During his time as postdoctoral researcher at Lawrence Berkeley National Laboratory and later as professor at JGU, he already published numerous articles in the most renowned scientific journals. He has been granted an Emmy Noether Grant as well as an ERC starting grant for his research on "Single metal nanoparticles as molecular sensors". Press release "Dynamics of individual proteins"
Press release "Chemists develop innovative nano-sensors for multiple proteins"
Press release "Gold nanoantennas detect proteins"